Tomaj Trenda received his degree in Dance in 1984 and has been working as a full-time professional dancer, educator and choreographer ever since. He has pursued extensive post-graduate training in various forms of dance as well as movement education for adults. As a dance faculty member at the University of Washington, Cornish College of the Arts, the University of the West Indies, the National Ballet of Mexico and the College of Marin, Tomaj taught thousands of students the joy of dance. He has performed Internationally with the Robert Davidson Dance Company, Men at Play, and The SugaDance company. He began dancing Salsa in 1994 and has been teaching Salsa exclusively for the past 7 years. He has perfomed at the world's largest Salsa Congress in Los Angles with The SalsaMania Dance Company and directs of the SalsaFire Dance Company in San Francisco. His focus for his professional career has been to provide the student with the highest-quality learning experience possible...Excellence in the Art of TEACHING dance. He currently trains hundreds of students Authentic Club-Style Salsa every week via group classes and private lessons throughout the San Francisco Bay Area. 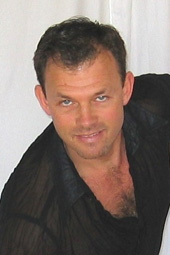 Tomaj teaches Salsa on1 and his dance products are available on Zone Free DVD.